Join us in celebrating the re-emergence of Twin Cities music and film scene staple, Chris Strouth Tuesday night at the 501 Club! 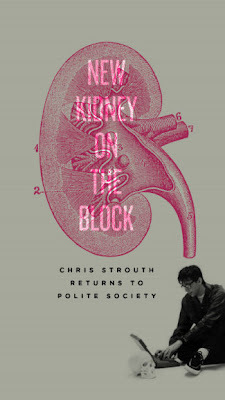 As many of you know, Chris underwent a much-talked-about kidney transplant in January that was arranged via Twitter. His new kidney, lovingly dubbed "William the Conqueror," was selflessly donated by Scott Pakudatis, an online acquaintance of Strouth who responded to a tweet Chris put out last year saying that he needed a kidney transplant. Pakudatis ended up being a match and the rest is social media history! On Tuesday, February 23rd join Chris and Guest of Honor Scott Pakudatis, along with their friends, families and supporters for a rockin' party at the 501 Club! Featuring awesome drink specials and music from DJ Jake Rudh, DJ Drone, Joseph Pettini, and Dean Vaccaro.